Carpet cleaning is a need that won’t go away anytime soon. Most business offices and commercial establishments often hire cleaning services, which include carpet and window cleaning, to keep their premises looking neat and organized all the time. Homeowners, likewise, get the services of professional cleaners to help maintain the aesthetic appeal of their houses. With the increasing demand for cleaning services, more and more individuals are looking at starting a carpet cleaning business of their own. It doesn’t have to be a large-scale operation in the beginning, but it can eventually be a lucrative enterprise if you keep these three things in mind. Like any other business, you have to establish legitimacy by securing the necessary permits to operate. Both residential and commercial cleaning services require licenses that you’ll need to secure from the state or cities where you’ll operate. Another important matter to decide here is whether you’ll set up your own cleaning company or invest in a franchise. The advantage of choosing the latter is that you’ll be carrying a trusted brand with a good following. The franchisor will also provide you with training, strategies, and a whole lot of how-tos to help get you on your feet. The downside, however, is that franchising fees alone can set you back between $20,000 and $50,000. This isn’t ideal if you want to start small and run a business by yourself. If you decide to go solo, meanwhile, there may be a lot of paperwork and certification to go through before you can start operating your business. Some of these vary from city to city, so be sure to check with the licensing department and prepare all the documents ahead of time. You’ll need more than a vacuum cleaner and a broom to run a professional carpet cleaning service. 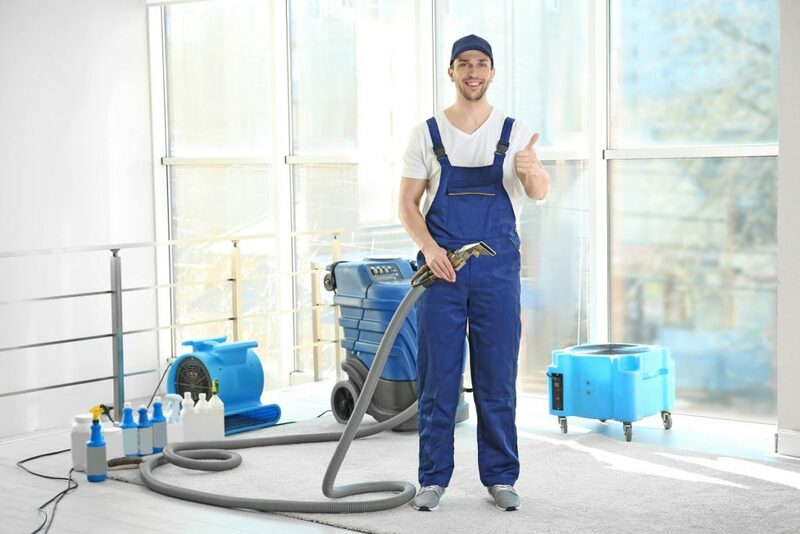 You’ll need industrial equipment if you will be cleaning entire buildings and massive offices. For home carpet cleaning, you also need to invest in heavy-duty equipment that can withstand regular and continued use. You also need access to extractors, hoses, brushes, cleaning solutions, stain removers and even pet odor removers. Find good and reliable suppliers to help you stay with one brand or company from the get-go. It will also be helpful if you can find suppliers for non-chemical-based or hypoallergenic cleaning solutions. Some homeowners or employees don’t like the strong smell of bleach and other sanitizers. A carpet cleaning business can be lucrative in the long run. A cleaning company can make anywhere from $80 to $100 an hour. The average rate is 30 cents per square foot, and that becomes more expensive due to other factors. Pet hair, urine, wine stains and other additional cleaning services will allow you to charge a higher rate than normal. Don’t be disheartened if your business is slow in the beginning. You have to build your network of clients and contacts consistently over time. Ask clients to give you feedback on your services and see how you can improve. Offer discounts to repeat customers. Ask them to refer you to friends and family, or neighbors who live in the same building. Carpets need to cleaned regularly to get rid of dust, pet shedding, stains and more. It’s a dirty job and someone has to do it. Why not you? This could be a very good business enterprise if you know how to play your cards right.